Sorting the Catch Andre Buchheister and Jason Romine prepare to sort the trawl-net catch during a ChesMMAP cruise on Chesapeake Bay. Photo courtesy of ChesMMAP program. Fish Diversity An example of the size and kinds of fish collected during ChesMMAP cruises on Chesapeake Bay. Shown are a large sheepshead, several striped bass, and a few other species including summer flounder, Atlantic croaker, Northern puffer, a Clearnose skate, and a kingfish. Photo courtesy of ChesMMAP program. Sort and Release ChesMMAP staff sort and measure their catch before returning the fishes to the water. Photo courtesy of ChesMMAP program. 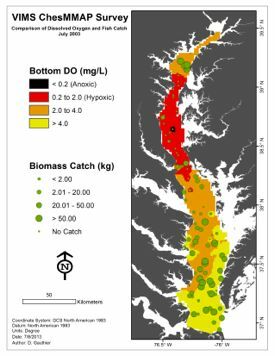 A 10-year study of Chesapeake Bay fishes by researchers at the Virginia Institute of Marine Science provides the first quantitative evidence on a bay-wide scale that low-oxygen “dead zones” are impacting the distribution and abundance of “demersal” fishes—those that live and feed near the Bay bottom. The study, published in a recent issue of Marine Ecology Progress Series, was authored by Andre Buchheister, a Ph.D. student in William & Mary’s School of Marine Science at VIMS, along with VIMS colleagues Chris Bonzek, Jim Gartland, and Dr. Rob Latour. 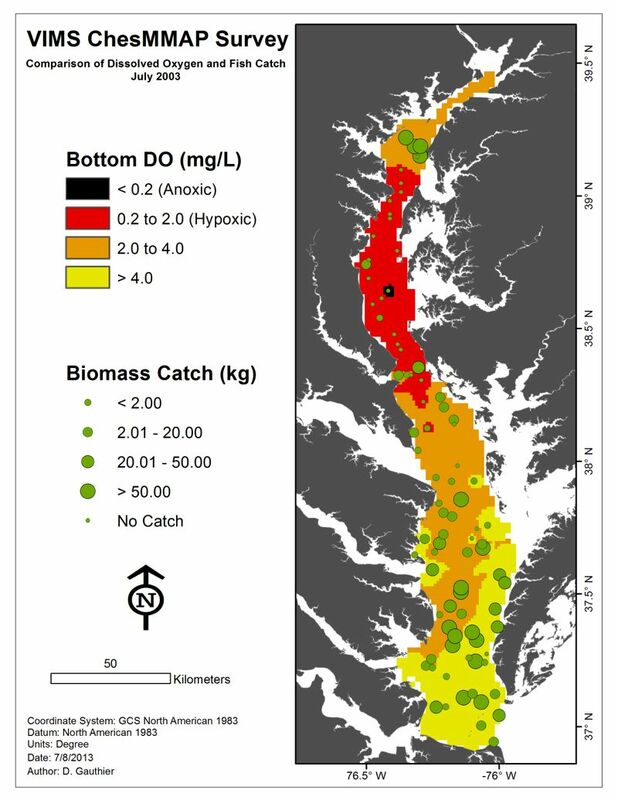 Buchheister says “This is the first study to document that chronically low levels of dissolved oxygen in Chesapeake Bay can reduce the number and catch rates of demersal fish species on a large scale.” He notes that other studies have looked at the effects of low oxygen on fishes within the water column and on demersal fishes within individual Bay tributaries. Low-oxygen conditions—what scientists call “hypoxia”—form when excessive loads of nitrogen from fertilizers, sewage, and other sources feed algal blooms in coastal waters. When these algae die and sink, they provide a rich food source for bacteria, which in the act of decomposition take up dissolved oxygen from nearby waters. 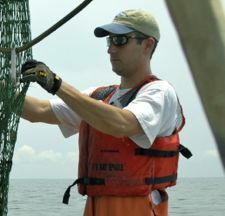 In Chesapeake Bay, low-oxygen conditions are most pronounced in mid-summer, and in the deep waters of the Bay’s middle reaches. “This appears to displace fish biomass toward the northern and southern edges of the bay’s mainstem channel,” says Buchheister. The fishes’ response at this value is interesting, says Buchheister, “because it occurs at levels greater than the 2 milligrams per liter that scientists formally use to define hypoxia.” Normal coastal waters contain from 7-8 milligrams of oxygen per liter.